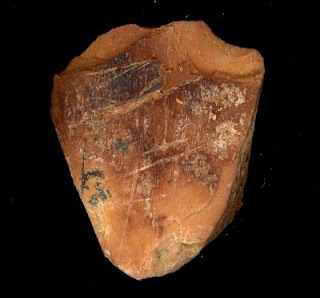 "The cut marks we are finding are both more abundant and more randomly oriented than those observed in later times, such as the Middle and Upper Paleolithic periods," says Prof. Avi Gopher of TAU's Department of Archaeology. "What this could mean is that either one person from the clan butchered the group's meat in a few episodes over time, or multiple persons hacked away at it in tandem," he interprets. This finding provides clues as to social organization and structures in these early groups of hunters and gatherers, he adds. Among human hunters in the past 200,000 years, from southern Africa to upstate New York or sub-arctic Canada, "there are distinctive patterns of how people hunt, who owns the products of the hunt, how carcasses are butchered and shared," Prof. Gopher says. "The rules of sharing are one of the basic organizing principles of hunter-gatherer cultures. From 200,000 years ago to the present day, the patterns of meat-sharing and butchering run in a long clear line. But in the Qesem Cave, something different was happening. There was a distinct shift about 200,000 years ago, and archaeologists and anthropologists may have to reinterpret hunting and meat-sharing rituals." Meat-sharing practices, Prof. Gopher says, can tell present-day archaeologists about who was in a camp, how people dealt with danger and how societies were organized. "The basic logic of butchering large animals has not changed for a long time. Everyone knows how to deal with the cuts of meat, and we see cut marks on bones that are very distinctive and similar, matching even those of modern butchers. It's the more random slash marks on the bones in Qesem that suggests something new." The Qesem Cave finds demonstrate that man was at the top of the food chain during this period, but that they shared the meat differently than their later cousins. The Tel Aviv University excavators and Prof. Mary Stiner of the University of Arizona (Tucson) hypothesize that the Qesem Cave people hunted cooperatively. After the hunt, they carried the highest-quality body parts of their prey back to the cave, where the meat was cut using stone-blade tools and then cooked on the fire. "We believe this reflects a different way of butchering and sharing. More than one person was doing the job, and it fits our expectations of a less formal structure of cooperation," says Prof. Gopher. "The major point here is that around 200,000 years ago or before, there was a change in behavior. What does it mean? Time and further excavations may tell." Qesem, which means "magic" in Hebrew, was discovered seven miles east of Tel Aviv about nine years ago during highway construction. It is being excavated on behalf of TAU's Department of Archaeology by Prof. Avi Gopher and Dr. Ran Barkai in collaboration with an international group of experts. The cave contains the remains of animal bones dating back to 400,000 years ago. Most of the remains are from fallow deer, others from wild ancestors of horse, cattle, pig, and even some tortoise. The data that this dig provides has been invaluable: Until now there was considerable speculation as to whether or not people from the late Lower Paleolithic era were able to hunt at all, or whether they were reduced to scavenging, the researchers say.